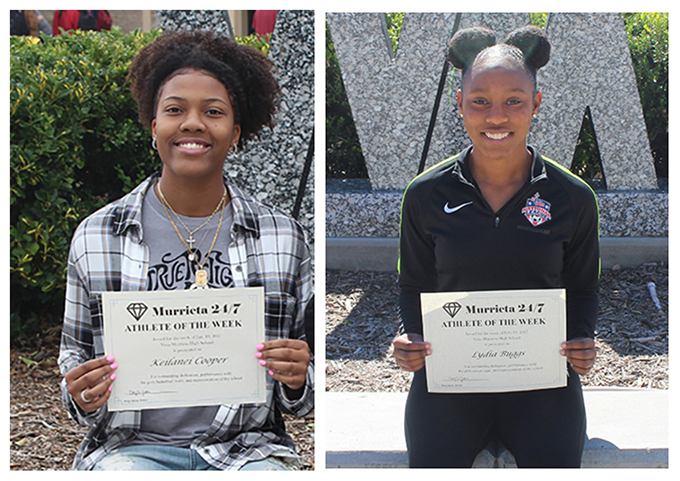 Keilanei Cooper (left) and Lydia Buggs are the Vista Murrieta Athletes of the Week. Keilanei Cooper of the girls basketball team had amazing finish to her season. In a 93-32 victory over Temecula Valley Feb. 8, she set the individual school scoring record with 47 points. In only 20 minutes, she made 18 of 34 shots, including 8 of 17 from 3-point range. In the Broncos' next game, she scored a game-high 23 points in a 79-28 win over Murrieta Mesa to help the team win its fifth consecutive league title. "It was more than likely the greatest week ever by an individual in the history of VMHS basketball," coach Kurt Ruth said about Cooper. Senior defender Lydia Buggs helped the girls soccer team win the Southwestern League title. The Broncos are 17-4-2 overall heading into Tuesday's CIF Southern Section playoff game at El Dorado.